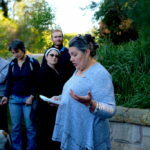 To observe National Sorry Day in Marrickville this year, the Cooks River Valley Association (CRVA), supported by the Gallipoli Centenary Peace Campaign, organised a walk along the Cooks River on Saturday May 26. The event attracted close to 40 people, including members of the Wiradjuri community from central NSW and a number of local Nepalese people. 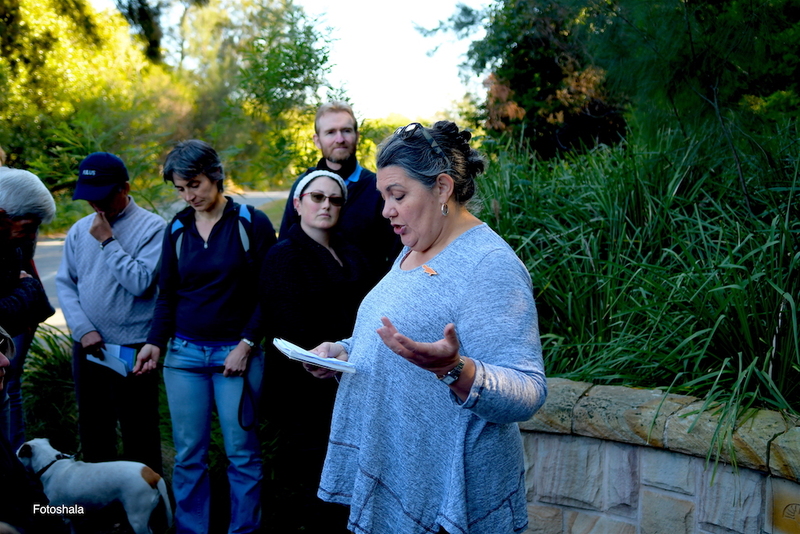 This year’s Sorry Day Walk was led by Jennifer Newman (CRVA’s Vice-President and local Wiradjuri woman) and was divided into three stages. The first stage was held at the Indigenous Interpretative Site called ‘Living on the Land’ in Steel Park. Here Jennifer offered an Acknowledgement of Country and noted that National Sorry Day is a day that pays tribute to the Stolen Generations and their families. This year commemorates the 21st anniversary of the Bringing Them Home Report which was tabled in Federal Parliament on 26 May 1997. The Bringing Them Home Report confirmed the large scale removal of Aboriginal children from their families and it recommended that a National Sorry Day be held each year on 26 May to commemorate the history of these forcible removals and the grief and dislocation it caused. Jennifer emphasised that Sorry Day commemorations around the nation are also part of the healing process, a process linked to advancing reconciliation between Indigenous and non-Indigenous people. The second stage of the event took place at another Interpretative Site besides the Cooks River called ‘Living by the River’ about one kilometre east of Steel Park. This reading was followed by a commentary on Prime Ministerial actions and statements on the theme of recognition. The Uluru Statement from the Heart met a similar fate to the Bringing Them Home Report. In October 2017, current Liberal Prime Minister Malcolm Turnbull, rejected the proposed reforms outright. Fortunately the track record of other non-Liberal Prime Ministers has not followed this lamentable pattern. Jennifer recounted the actions and statements of three former Labor Prime Ministers in this regard, including Gough Whitlam on the handback of Wave Hill Station on 16 August 1975, Paul Keating’s Redfern Park Speech on 10 December 1992 and Kevin Rudd’s apology to the Stolen Generations in Federal Parliament on 13 February 2008. The final stage of the Sorry Day Walk involved participants climbing the path to ‘Richardsons Lookout – Marrickville Peace Park’. There an additional talk was given by Anne-Maree Payne whose recent work has focused on the policies and practices of child removal and their impact especially on single mothers of the Stolen Generations. In a previous study of the National Inquiry into the Separation of Aboriginal and Torres Strait Islander Children from Their Families, Anne-Maree found that of the 600 plus individuals who shared their stories with the National Inquiry, not one Indigenous mother came forward to share their experiences and suffering caused by child removal. To address this absence of Indigenous mothers’ voices in the Bringing Them Home Report, Anne-Maree began PhD research into the circumstances that Indigenous women faced as mothers. The lack of legal protections for Indigenous mothers compared to their non-Indigenous counterparts in most States and Territories. For example, in South Australia, Western Australia, Queensland and the Northern Territory, Indigenous parents had no rights with respect to their children. Rather the Chief Protector of Aborigines was the legal guardian of all Aboriginal children in these jurisdictions with the power to remove them from their families and place them in homes or in ‘service’ i.e in work. Racial discrimination relating to social security benefits such as the baby bonus and the parenting allowance. This meant that Aboriginal parents were specifically excluded from such benefits resulting in poverty and deprivation. Having created these dire conditions, white authorities then acted to “rescue” Indigenous children from these circumstances. Practices enforced by managers of missions and reserves that required Indigenous mothers to work for non-Indigenous households on stations or in remote locations. This resulted in Indigenous mothers having to make alternative childcare arrangements since they were not permitted to take their babies with them. As domestic servants, these young Indigenous mothers were often put to work as carers of white babies and children. Compounding these discriminatory laws and practices was the perception within white society throughout much of the 20th century that Indigenous mothers were deficient, emotionally disengaged to varying degrees and even a threat to children of mixed heritage. Unfortunately remnants of this perception can still be found in our society today. While the publication of the Bringing Them Home Report elicited much sympathy for Indigenous children who were removed from their families and communities, the same cannot be said for the Indigenous mothers or parents. Their stories are often complex and have been subject to misrepresentation as noted above. 1. For a detailed philosophical justification of political apology and the capacity of states as agents to take responsibility for past wrongs and commit themselves to avoiding wrongdoing in the future, refer to Janna Thompson’s paper ‘Apology, justice and respect: a critical defence of political apology’. 2. The poem ‘Seasonal Revelations’ can be read here. 3. Jennifer Newman’s talk on the theme of recognition can be listened to here. 4. Anne-Maree Payne’s PhD entitled Untold Suffering? : Motherhood and the Stolen Generations was completed in 2016 and can be accessed here. Refer in particular to Chapter 3 ‘Stolen Motherhood? : structural barriers to Aboriginal mothering in the Stolen Generations era’, pp. 115-152 and Chapter 4 ‘No common ground: perceptions of mothering in the Stolen Generations era’, pp. 153-216. 5. Anne-Maree’s talk on the structural barriers to Indigenous mothering can be found here.